On June 21, 2010, coincident with the longest day of the year was the longest page 1 investigative report I have ever seen in the New York Times or any other prominent newspaper for that matter. 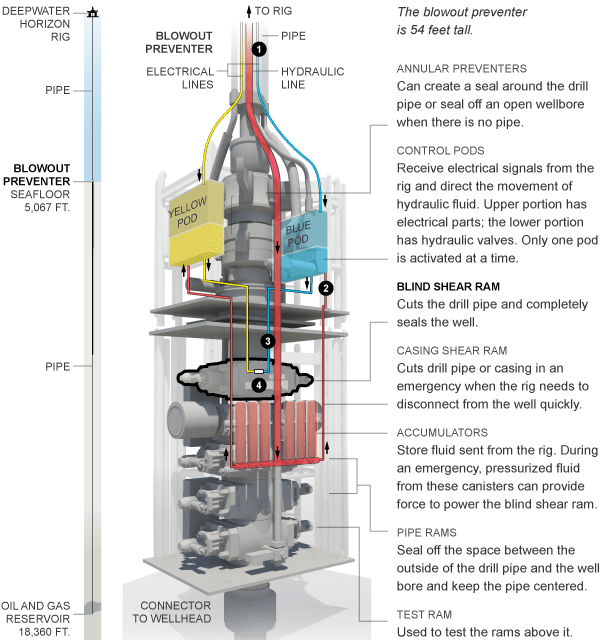 I refer to the story entitled Regulators Failed to Address Risks in Oil Rig Fail-Safe Device, nearly three pages long and entirely devoted to the esoterica surrounding blow-out preventers. This is good because prior to this I would not have dared post a piece discussing blow-out preventers, not to mention blind rams. It is quite well written relative to the operational detail. But there are minutiae that would leave most fatigued. So, here is the short explanation together with some commentary. The last line of defense against blow-outs is a system of machinery aptly known as blow-out preventers or BOP’s. Multiple other lines need to be breached prior to these being in play. In keeping with the Times authors, we will not discuss these except to point out that nobody really wants to resort to the last line. Some of the reporting has attributed sentiments to personnel to the effect that “that’s why we have the BOP’s” as an explanation for risk taking. If true this is not usual. To use a soccer World Cup analogy (it is the season), full backs who espouse such a belief with respect to their goalkeepers have short careers. There are three types of BOP’s. The most benign, and this one is used for pressure testing as well, is the Annular Preventer. This is composed of elastomeric elements that can seal off the pipe on the outside or seal the hole when no pipe is present. This is a fully reversible action and the Preventer with the least deleterious consequences of use. According to the Times, there were two of these on this rig. A 60 Minutes segment had reported a worker observing chunks of “rubber” several days prior to the accident, which he conjectured to imply failure of the Annular Preventer sealing elements. Congressional testimony indicates reports of pressure integrity tests which showed anomalies that appear to have been discounted by the decision makers. These test the competence of the completion. These could not have been conducted if the Annular Preventer was not sealing. So, one of them was likely functioning at least at the time of the tests, which was not long before the event. So, it is plausible that this line of defense was functional close to the time. The next line is the Casing Shear Ram. These are essentially irreversible if there is pipe in the hole. They are shear devices that can cut through the casing but they are not designed to seal the flow. They are primarily used to permit emergency disconnect of the vessel. No real data are reported on whether the Casing Rams were functional. Then we have the centerpiece of the Times story, the final line of defense, the Blind Shear Rams (is it not odd that all the words could apply to sightless sheep; memo to animal activists: the rams are not being killed, they are doing the killing). These are the most sophisticated of the three types and are designed to cut through the pipe and seal firmly in place. The well pressure is designed to help augment the closure mechanism and hold it in place. The reporters make much of there being a single point of possible failure of the hydraulic system and the reports of unreliability. I assume they did their homework here, but have no other insight. But very interesting is their observation that this rig had only one of these. This is surprising for a deep water rig. Here’s why. The pipe it is designed to cut through is not a continuous cylinder. At intervals of 40 feet, sometimes 30 feet, there are joints. The blind shear rams cannot penetrate the joints. So if by bad luck a joint is in its path, the mechanism will not succeed. This is why a second one is important to have, and at a distance no less than 4 feet from the first, but not much further such that there is no likelihood of another joint being encountered. The story also noted that gamma ray testing had shown that at least one side of the blind shear ram had deployed (the other side could not be imaged) but stopped short of cutting. The evidence shows that at least one of the Annular Preventers was functional at the start. We know nothing conclusive about the Casing Shear Rams. Somehow, these lines of defense crumbled. Unfortunately, the key data indicating hydraulic and other health of these devices did not survive the explosion. Apparently these data are not shipped to shore. Virtually all data related to drilling and completions are streamed to shore. So, where do we go from here? Requirement for an expert level of shore support for all key well control decisions, including involvement of the appropriate federal agency, which should be staffed at an expert level. Through the use of real time support centers covering a number of wells each, the federal agency cost need not be high. All key data upon which well control decisions are made should be stored in a Black Box. Ideally, they are already on shore and stored as part of the expert review process mentioned above. Finally, taking measures such as those above will achieve important results such as avoiding costly near misses, but in the end likely will not avoid the occasional blow-out, in part because other factors may come into play. But, we can be in a state of readiness to dramatically reduce the collateral damage to the environment by minimizing the size of the spill. We urge a joint industry action to study the best form of defense beyond BOP’s. This should be clean page look at all alternatives and should be led by a non-aligned person. Then the industry should agree collectively to have such a system built and ready for deployment at the shortest possible notice. You are currently reading What Really Happened Out There in the Gulf at Research Triangle Energy Consortium.